Whenwas the last time you checked your backup? When was your last backup performed? Setting up an automatic backup of your system is critical to maintaining a healthy organizational system. There are lots of great options for both Mac and Windows, many of which are easy to setup. For example I use Apple’s Time Machine to backup my workstation. Once I setup a Time Machine drive I can leave it plugged in and it updates every hour. I never need to think about it again unless I need something from the backup. At least that’s the conventional thinking. But set and forget on a backup can lead to serious issues. 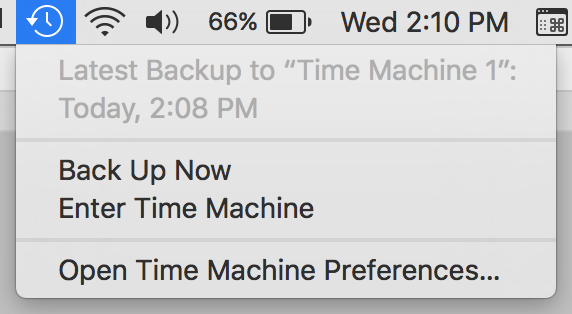 A good client recently had an experience with her Time Machine backup that serves as a reminder that we need to periodically check our backups to ensure they are doing their jobs. My client took her iMac to an Apple Store to have the hard drive exchanged for a newer one. The technician at the store asked her if she had a backup before they began working on her system. She responded that she had a Time Machine backup drive plugged into the system at all times. When my client picked up her iMac from the store and returned home, she attempted to restore her system using her Time Machine backup. She was shocked to learn that the most recent backup on her Time Machine backup was six months old. For some reason Time Machine had quit working and she hadn’t noticed. This let to a real mess that took lots of time and money to sort out. I have had the same experience with not noticing that a backup failed using Time Machine, as well as other backup solutions such as Chronosync. My client’s experience was a good reminder that it’s important to monitor your backups to make sure they are doing what you want them to do.